After a long, brutal winter, Baseball Season formally kicks off Sunday night with the World Champion Phightins taking the field at 8.05. [Archbishop Timothy Dolan] has put the hammer down on Catholics hoping to enjoy a brat during the Brewers' home opener, because it happens to fall on Good Friday. Dolan says Catholics attending the home opener, or just with baseball fever for the Good Friday, April 10th game against the Chicago Cubs, still ought to abstain from meat and poultry. "I think instead of eating the sausages or hot dogs that day, they just should say a prayer for the Brewers success this season," said Dolan. Fish fry baskets, meatless nachos, cheese fries and lots of other concession options are available at Miller Park for Catholics who abstain from meat and poultry. For the record, the above header is a recycle from 2005, when the Boston Red Sox opened at Fenway on Good Friday afternoon. Despite an outcry in Beantown over the scheduling, it was the season the team went on to break The Curse. Clearly, the Good Lord was merciful. And speaking of the next archbishop of what Sox Nation calls the "Evil Empire," in 1993 John Cardinal O'Connor announced that he was boycotting baseball for the entire season after the league set Opening Day on Good Friday. At his 1984 installation, the the late, great "lion" of Madison Avenue donned a Yankees cap during his first homily in St Patrick's Cathedral. 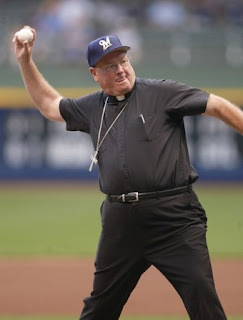 With O'Connor's spiritual heir 11 Days from his own arrival into the House That Hughes Built, bets are going around as to what Dolan -- who once, famously, donned a cheesehead in mid-preach -- will choose for his Opening Day props. Suffice it to say, it might just pay to remember who owns the Rangers and the Knicks. The weekend following his 14-15 April installation, Dolan's heading to Citi Field -- the new home of the Mets -- to welcome the Brewers to the Big Apple; the Milwaukee squad'll be in for a weekend stand.